I've been a little bit MIA lately, partly because I haven't been feeling particularly athletic lately and partly because my hands are pretty full right now. A combination of exhaustion and physical pains from carrying a 21+lb baby around has sidelined me from running and other high-impact workouts for the past couple of weeks. I feel like I got carpal tunnel syndrome in both wrists and one of my ankles, plus I've had a temperamental knee so running isn't very fun right now. Overall, I've just been feeling pretty beat-up. Instead, I've been doing more barre-type workouts, walking, and Pilates, mostly from DVDs or YouTube videos. 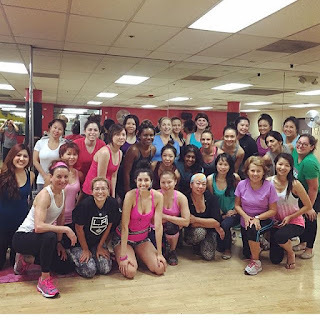 I even started doing occasional group exercise classes, which I have not really done before. As the weather is (finally!!!!) cooling down a bit, though, I hope that will motivate me to try to run more... and maybe I'll feel like I have something to write about in this running blog again. As a result of not feeling up to blogging, I'm a bit behind in reviews, but I am going to play catch-up since the holidays are coming (!) and I feel like reviews need to be done. 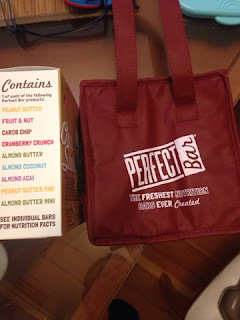 I received a huge box from Perfect Bar recently that contained a cute insulated bag and a variety of their bars. I've had a few of their bars before. They are distinguishable from other bars in that they are found in the refrigerated section at the store. 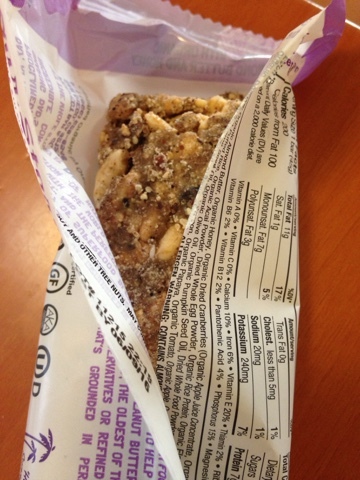 They are not chalky like other bars and are full of whole foods like eggs and seeds. I've been trying to mind my nutrition more lately to try to get over my beat-up feeling, so these are, well, perfect. I typically associated them with high-calorie peanut flavors, but as you can see from the box, they have lots of other flavors as well. The one below is Almond Acai. It was not heavy and was only 200 calories! I go the extra mile and freeze them because I tend to freeze everything. I don't think I'd recommend eating these frozen without letting them thaw a bit, though, as they can get a bit rock-solid. Also, I gotta say... I'm typically not a huge fan of the taste of straight-up honey, which these bars definitely do have... but it actually is pleasant in these bars. 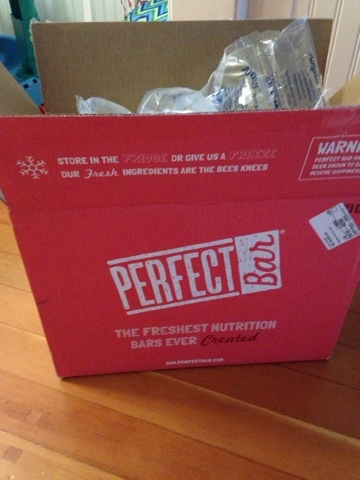 These bars looks yummy!! Hang in there, I'm feeling the same way!! Phew, 21lbs! Baby is five pounds behind but oh what a difference that makes! He is also crawling and pulling up (at 5.5 months, ridiculous child) and so...here we go. Hang in there!!! I completely hear you on motivation. I really enjoyed group exercise classes as a motivator when I was pregnant! I am stealing the questionnaire from your last post, when I find time to post again! Thanks for the bar review (now you are also filed in my head as Nutrition Bar Expert Lady). Alas, no more bars for me. My taste buds have gone back to normal which means no more sweets, do all my snacks are things like almonds, hard boiled eggs, and string cheese. And by last post I meant latest, darn phone keyboard.